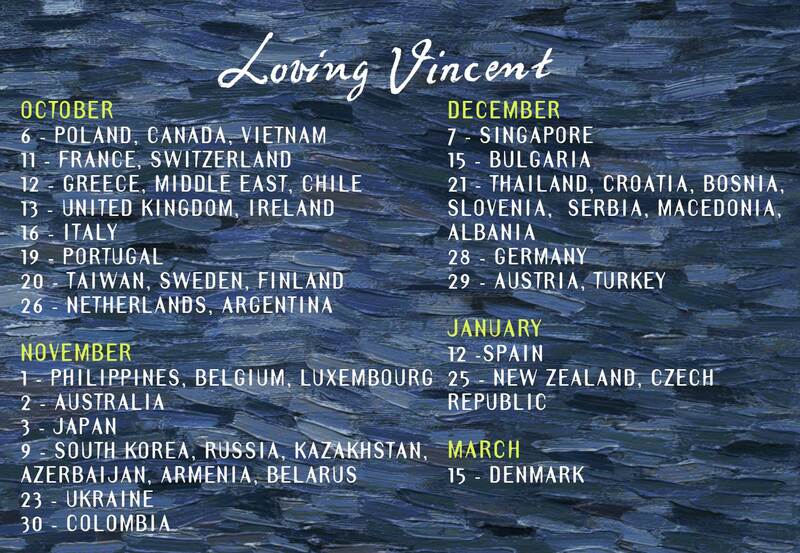 Lucky Vincent fans in Poland, Canada and Vietnam can see Loving Vincent on the big screen from today as the film goes on general release in these territories. In Poland our distributor is Next Film - visit their website for more infomation on screenings. In Canda the film is being released by Mongrel Media - details here. And in Vietnam MVP are releasing the film - find a list of cinemas showing the film here. Loving Vincent also expands to several more cities in the US from today. Below are the release dates our other international distributors have confirmed with us to date - find out who has the rights for your country here and make sure you subscribe to the newsletter for updates.